Even more motivation to complete the Triumph T100R project. The next project is waiting in the garage. 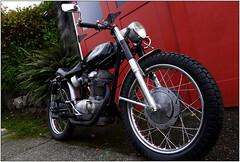 A '66 Ducati 250 Scrambler. The bike is almost completely stock. The bars are aftermarket, but I have the originals that came off it. I think I'll have to add a horn to bring it up to street legal, but that is a small price to pay. I've got to get the Triumph done so I can get this beauty up and running! 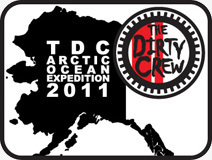 Swamp Monster's photo shot during The Dirty Crew's Arctic Ocean Expedition makes the AltRider November 2011 Newsletter cover! Swamp Monster, Ghostface KLR, and MotoBum hit the trails of Tahuya on Sunday, November 6, 2011. We all discovered how blazingly fast GFKLR's Gas Gas EC300 is and how easy it is to push-start Swampy's Honda CFR250X after kicking it for half an hour in attempt to light its very cold fuse. It turned out to be a bad fuel screw setting, but we had a good time. KLR2 is home from the Great White North, but still not running. Today I had a little time to tinker a bit. I pulled the battery to check the electrolyte level, only there was none. Bone dry. Filled it up with distilled water and now it's charging up. Also drained the carb just in case some water got up in there. A fresh gallon of gas is ready to go in. When that battery is charged up, we'll see what happens.